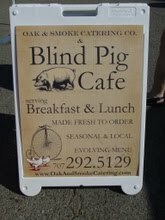 Jeff Nunes of Oak and Smoke Catering and the Blind Pig Cafe – makes different treats for market goers to try. 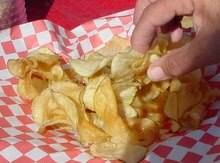 This Wednesday you missed fresh, hot potato chips. 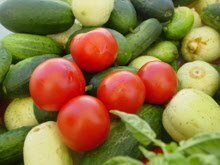 During the next few months running WIC is sponsoring a farmers market next to the Social Security office in Santa Rosa. The market is open to everyone. Pictured Chef Eichhold looking for the perfect pepper at the Triple T stand. Freshly dug new potatoes need very little to make them into a special dish. It’s probably not a coincidence that garlic and potatoes come into season about the same time. 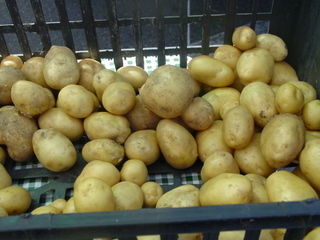 Some of the vendors have many varieties of potatoes…find the one that is just right for the dish you have in mind. The Market is open during the county fair. The Fair doesn’t open until 11 AM so there will be minimal impact on Wednesdays. Saturdays come early or better yet come Wednesday if you can. It’s a good reason to try out the Wednesday market. It’s probably the moment you’ve been awaiting for weeks, maybe months. I am delighted to proclaim that our tomatoes are finally starting to ripen! We don’t have lots yet, but if you make it to the Santa Rosa Farmers’ Market early enough, you might be able to get some of our oh so delicious and satisfying Early Girls and Big Beef Beefsteaks. Almost as exciting as the tomatoes is our bounty of sweet, crunchy cucumbers. We are growing Armenians, Tasty Jades (long Japanese), and Divas (a superb salad/slicer), each of these is awesome tasting and perfectly suited for any cucumber need (gazpacho, tzatziki, raita, cucumber salad, sandwiches, smoothies, juices…whatever!). Of course, we’ll also have summer squash and zucchini at the Market. Pair with tomatoes and basil and you have a tasty and healthy take on ratatouille. Hankering for a massive pesto making session? We’ve got you covered! We have plenty of basil for any project (hint: if you need basil in bulk, ask us and we’ll do our best to give you a deal). We’re also harvesting full sized red torpedo onions, Black Mission Figs, our first ripening Gravenstein apples, rainbow chard, arugula (perfectly zesty, but not too hot! ), spring mix (a specially selected mix of heirloom lettuces), and assorted flower bouquets. And I can’t forget to mention the Cleland Ranch eggs that we are selling on behalf of a neighboring family farm. These eggs are dang good! The chickens roam around in a huge open air pen (for their protection, not confinement) and eat loads of fresh greens and veggie scraps, making their eggs super flavorful and rich, with dark orange yolks that stand up tall and whites that don’t evaporate away to nothing when you cook them in a skillet. I’m not typically an egg fanatic, but these eggs have me addicted. Oh well, I suppose there’s far worse things to be attached to than free range eggs. 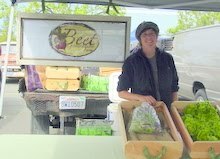 “Beet Generation Farm is owned and operated by Libby Batzel and Ali Levesque. Our life purpose is personal health and inner vitality. In a culture filled with hormonally charged, chemically poisoned, supplement junkies, we recognize our current food system is flooded with toxic pesticides, synthetic hormones, genetically modified organisms, large industrial operations, and over-processed, over-salted and over-sweetened products. These types of foods do not create health for humans or for our environment. Making mindful choices about what we eat allows us to become nutritionally balanced, consciously cared for, wholesome human beings. This is our life goal and the inspiration for Beet Generation Farm. These are “Early Girls’ from Armstrong Valley Farm in Guerneville. Most of the produce vendors have some tomatoes –lots of local cherry tomatoes around. The biggest tomato vendor in the County “The Patch” says have patience for the heirlooms …they are coming. This year the USDA is suggesting people should get to know farmers. 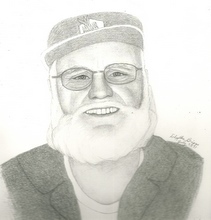 Market regular Edythe Briggs has captured Robert the Apple Guy perfectly. We think she must know him very well. Robert is at the market Wed and Sat apples, plums (and prunes) and apple juice. 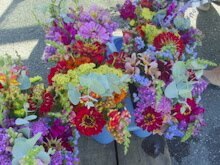 “Santa Rosa has a new farmers market, bringing the total number of year-round and seasonal markets within the city to six. 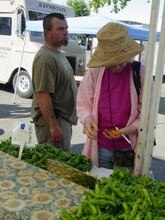 The newest market, which opened on Thursday, July 7, is a satellite of the Santa Rosa Original Certified Farmers Market. Located behind Coddingtown and in front of the offices of WIC (the federal Special Supplemental Nutrition Program for Women, Infants and Children, administered by the county), this new market reaches out to a densely populated yet underserved area, where many residents are low-income.